The pig have been for its epitheliochorial type of placentation, anatomical and physiological similarities to the human frequently used biological model among large animals. 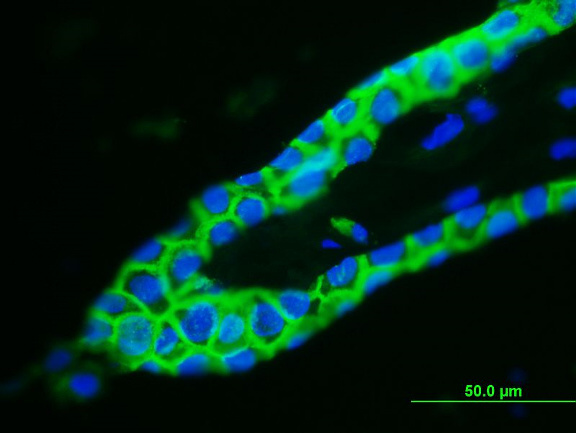 The amniotic cavity creates relatively isolated microenvironment suitable for prenatal development of mammals. Preterm labor and delivery are associated with 75% of all perinatal morbidity and mortality. One of their possible reasons can be an intra-amniotic infection. It may be caused by a variety of microorganisms including of ascending infectious agents from vaginal microbiota. Elevated levels of inflammatory cytokines such as interleukin-1 beta (IL-1 beta), IL-6, IL-8 and tumor necrosis factor alpha (TNF-alpha) in the amniotic fluid suggests an infectious background even when clinical signs of infection are lacking. Integrity of amniotic membrane can be characterized by expression of tight junction proteins like ZO-1, claudin-1, and occludin. Fig. 1 documents ZO-1 in swine amiotic membrane. The gastrointestinal tract of mammalian newborns is colonized first by the mother’s vaginal and intestinal microflora during delivery and progresses from sterility to dense microbial colonization in the first years of life. Eventual microbial settlers ten times overnumber cells of the host body. Surgically-derived gnotobiotic animals lack microbiota common in conventional animals. They are, with their simplified, controlled and defined microbial colonization suitable biological models for the study of microbe–host interactions because obtained results are not affected by background effects of the non-defined microbiota. The miniature pig add its size as another bonus property for easier manipulation and breeding in space-limitid gnotobiotic isolators. Fig. 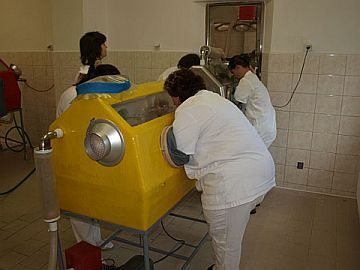 2 Hysterectomy-derived gnotobiotic piglets are reared in fibreglass isolators.